ABIN184834 staining (1µg/ml) of Human Testis lysate (RIPA buffer, 35µg total protein per lane). Primary incubated for 1 hour. 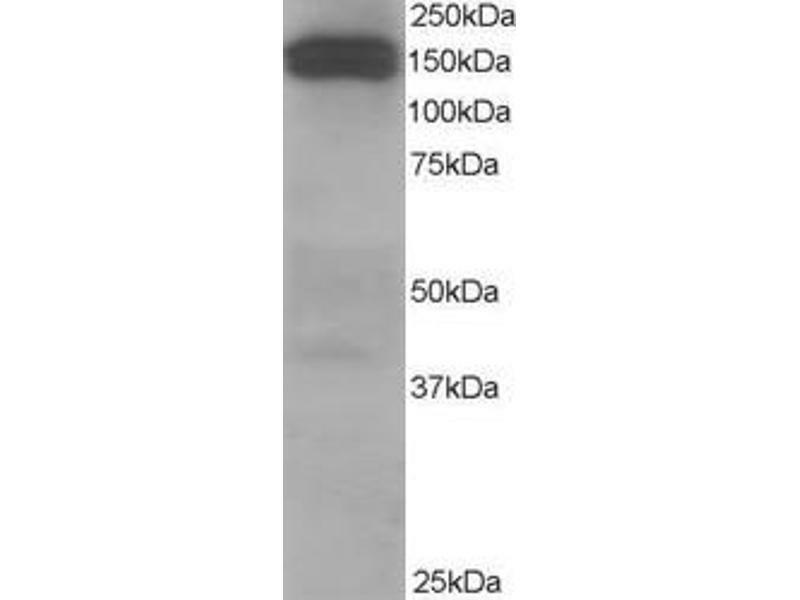 Detected by western blot using chemiluminescence. ABIN184834 (2.5µg/ml) staining of A) paraffin embedded Human Cerebellum and B) paraffin embedded Human Cerebellum. 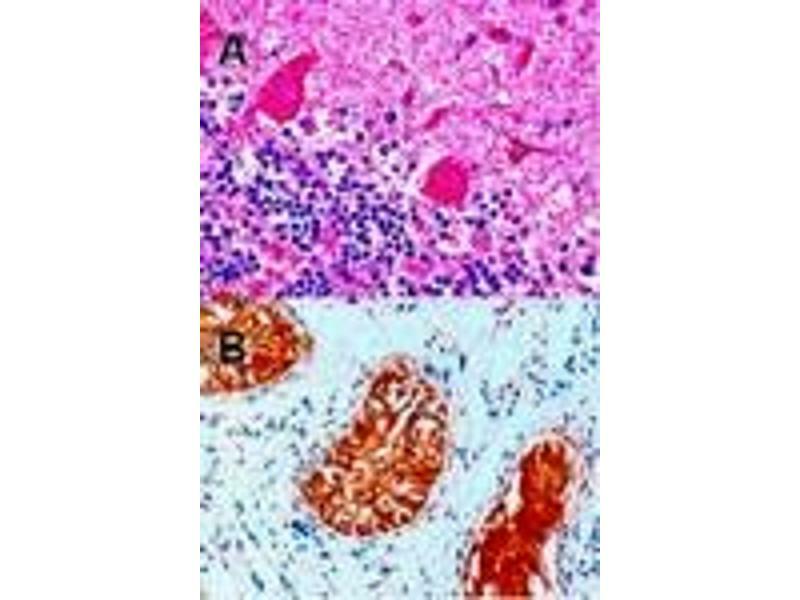 A) & B) Steamed antigen retrieval with citrate buffer pH 6, AP-staining. ABIN184834 (2.5µg/ml) staining of paraffin embedded Human Cerebellum. Steamed antigen retrieval with citrate buffer pH 6, AP-staining. 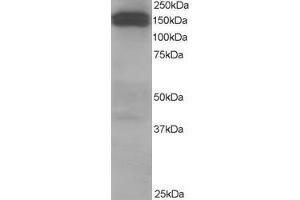 Specificité This antibody is expected to recognise all reported isoforms. Immunogène Peptide with sequence C-QEQLHQLHSRLIS, from the C Terminus of the protein sequence according to NP_004073.2, NP_075408.1, NP_001128512.1, NP_001128513.1. DS WB Results: Approx 150 kDa band observed in Human Cerebellum lysates (calculated MW of 142 kDa according to NP_004073.2). Additional bands between approx. 40-70 kDa were consistently observed, and all were successfully blocked by incubation with the immunizing peptide. Recommended concentration 1-2 μg/mL. Primary incubation 1 hour at room temperature. Preliminary testing was unsuccessful on Rat Brain and Testis for this particular batch. DS IHC Results: In paraffin embedded Human Cerebellum shows pixulate staining of cytoplasm in neuronal cells. Recommended concentration: 2-4 μg/mL. A customer found positive results in IHC on Human HeLa cells. 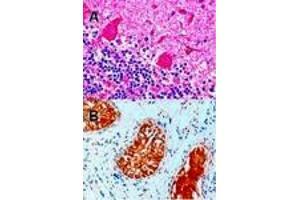 Peptide ELISA Statement: Peptide ELISA: antibody detection limit dilution 1:128000. Immunofluorescence: Strong expression of the protein seen in the cytoplasm of HeLa and U2OS cells. Recommended concentration: 10μg/ml. Immunocytochemsitry: A customer found positive results in ICC on Mouse embryonic fibroblasts (MEF cells). Flow Cytometry: Flow cytometric analysis of HeLa cells. Recommended concentration: 10ug/ml.